Significance - why the Lake Sammamish Basin? The Lake Sammamish basin is part of the larger Seattle metro area (the 15th largest metro area in the U.S.) where 94 different languages are spoken. This cultural diversity is an important consideration in planning community engagement and presents a notable opportunity to engage many people who may be building their knowledge of and experience in the outdoors. The Lake Sammamish basin serves as a gateway to the many rivers, lakes, forests and trails in the Central Cascades and beyond for nearby urban residents and visitors. The basin includes hundreds acres of public lands and parks that provide connections to urban natural areas, enhances residents’ daily lives and provides support for the recovery of kokanee salmon. The current and ongoing efforts by the Lake Sammamish Kokanee Work Group to conserve native kokanee salmon combined with the resources of the Issaquah Salmon Hatchery (most visited hatchery in the state – 200,000+ visitors annually), Lake Sammamish State Park (1 million+ visitors annually), Marymoor Park (3 million visitors annually) and Issaquah Salmon Days (180,000+ visitors annually) provides a strong foundation to develop the Partnership. 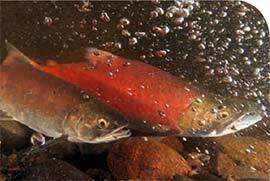 Native kokanee salmon have experienced severe declines in abundance, diversity, and distribution in recent years, but their prospects for recovery in the Lake Washington-Lake Sammamish Watershed are significantly better with the help and engagement of local residents, businesses and visitors. Kokanee salmon are the icon to connect area residents, businesses and visitors to the outdoors. Kokanee salmon connect the water to the land and help us understand how our individual actions can impact the world we live in. Actions to conserve kokanee salmon provide tangible opportunities to engage adults, youth and families in resource stewardship. Goal - what do we want to accomplish? The Partnership will build a connected conservation constituency in the Seattle metro urban area that engages in outdoor experiences and is inspired to conserve fish and wildlife in our shared watershed for future generations.